Appreciated the safety briefs given the challenging terrain and the information on local spots – I felt I learned a lot about the area too. The booklet you sent out showing the itinerary with Garmin course profiles was great! A: Our cycling holidays are designed to be challenging cycling holidays. Our professional guiding and vehicle support as well as our route design and hotel selection are all aimed at creating a supportive environment that will get the best out of you as an individual. Therefore each cycling holiday is designed to be suitable for varying fitness levels. Within the group people will have different strengths and weakness, some will love hill climbing but might be slower on the flat sections where you might be stronger. Clearly you need to be fit to get the most of the holiday and cycling in the mountains is much more rewarding when you see your pre holiday training pay off as you climb cols and surpass your expectations. These cycling holiday tips will help you get in shape and one of the many benefits of a Brevet cycling holiday is that you will get fitter as the week progresses. Following a training schedule consistently will help. If you have any concerns at all don’t hesitate to get in touch. Our aim is that you will go back home fitter, happier and in love with your sport. Q: Will we ride in a group? A: Yes. We encourage group riding because it is fun, a great way to learn group riding etiquette and an opportunity to practice sportive racing skills. However our combination of nightly route briefings, GPS files, route cards, guiding and vehicle support mean that everyone can go at their own pace. Typically we regroup at the bottom and top of climbs for safety and to benefit from the efficiency of group riding in the valley segments of each route. Climbing is done at your own pace and we specialize in helping you improve descending confidence over the course of your trip. A: Your safety and enjoyment is our priority and your Brevet Team will include 1 guide for every 6 riders. We keep group sizes small and larger groups are split according to average speed so you will be riding with people of a similar ability. Q: How long are the rides? A: Each day you can expect to ride at least 50km. Each route is picked for its scenic beauty and terrain. We typically build up to one or two intensity peaks during the week with recovery and days interspersed. It is actually during rest and recovery that your body gets fitter. Longer routes either have an option to cut it short if your legs aren’t feeling too good or the option to jump in the support car and cheer on your friends! If you look at a particular day and think a 60km loop isn’t that big a ride, then remember that riding on your local hills in winter isn’t the same as cycling in the mountains in summer! A typical 60km mountain tour will involve 3-4 hours of riding time. Q: How tough are the hills? A: OK so we can’t lie to you. 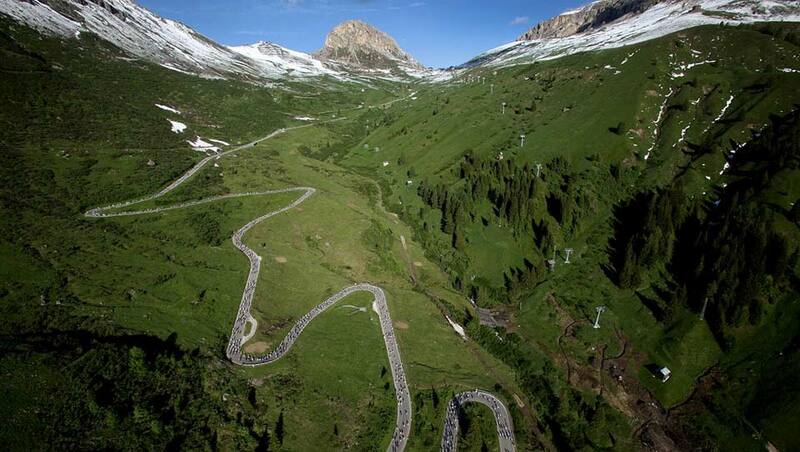 We are based in the heart of the Dolomites and the climbs are regularly used in the Giro d’Italia. What we do to help you manage the climbing is have small groups so that you are riding with people at a similiar climbing pace. Q: Is there a guide? A: There’s always a guide with you on the road. Depending on the route and the group and your fitness level within the group we will either be on the road with you, following in a support car, or both. You will be able to call on us if you get a puncture or for an extra energy bar to get you over that final climb. We carry spares and snacks and stop regularly for coffee stops at cafés. You will receive a comprehensive Road Book before your holiday and route briefings before each ride and if you are using GPS you can download the route. Q: Will there be a support vehicle? A: Yes. The Brevet Team Car will be supporting you by carrying bike spares, your wet weather clothes, sports nutrition, hydration tablets and water. The Brevet Team Car is in constant contact with your own the road guiding team ensuring you have first class Pro Support. Q: Can I bring a non-cycling friend or partner? A: Absolutely. Our Corvara hotel is in the heart of the Dolomites with lots to do for non-cyclists from hiking, adventure sports and chilling out in the spa. Q: I’m training for a sportive can you help with my training plan? A: Yes! Our 12 week sportive training plan will help you get into great shape. Brevet’s cycling holidays are perfect if you are training for popular sportives like the Maratona dles Dolomites. Q: What bike do I need? A: A road cycling bike with either a compact or three-ring chainset will allow you to keep pedalling steadily and smoothly as we pace ourselves up the hills. You should have two bottle cages, two water bottles and either a spare inner tube or puncture repair kit in your saddlebag. If you have the option of having more gears in the back then do it! We ride 50/34 compact on the front and 11-28 (and even 30/32) in the back. If you don’t know what that means and are concerned at all then contact us, we’re here to answer your questions! Q: Can I hire a bike? A: Yes you can though we do recommend bringing your own bike. We work with local bike shops with quality bikes to hire so check out these bike hire options. Q: I want to bring my own bike, how do I do that? A: It’s really easy using a bike travel box. You can either buy one or take advantage of a bike box rental service. Buying one is a great investment and can be really useful if you need to store your bike over winter. We will pick you and your bike up at the airport and it will arrive safe and secure in a bike box or soft case. You can take advantage of exclusive Brevet discounts if you buy or hire a bike box with one of our partners. Q: What bike tools do you have? A: We have the highest quality Park Tool professional bike tools and Park Tool repair stand available to you when you are building up your bike. If you used a very specific tool to dismantle your bike for transport then make sure you bring it unless it is on our full list of bike tools. We have access to local bike mechanics so if you’d like to book a professional to rebuild your bike just let us know. Remember it’s always a good idea to pack helmet, pedals and cycling shoes in your hand luggage, if something does go wrong with your bike luggage we can easily hire you a bike. A: Packing for a cycling holiday is made a lot easier with this cycling holiday packing list. Q: Are airport transfers included? A: Yes. Return transfers from Venice Marco Polo Airport during a specified Transfer Window. We’ll be waiting for you as you exit security wearing red Brevet T-Shirts – you won’t miss us! Can’t make the transfer window? Check out these Transfer Options to work out your travel plan. Q: Can I book additional hotel nights? A: Yes. If you would like to extend your stay we can book additional hotel nights in our partner hotel in the mountains at preferential rates. We also recommend convenient airport hotels at Venice Marco Polo that allow you to make use of our Included Airport Transfers. A: Yes, it’s a condition of booking your holiday that you have full travel, medical and personal accident insurance. Q: Can you cater for special dietary requests? A: No problem at all. Just make sure you mention them in the space provided on your booking form. Q: Does the hotel have Wifi? A: Yes there is wifi throughout the hotel. But you might want to leave the office in the office. Q: What are the booking conditions? A: Please check out our full Terms and Conditions. Q: How do I Book and Pay? A: That’s the kind of question we love! For step by step instructions see our How To Pay guide.